Super Savings Item! 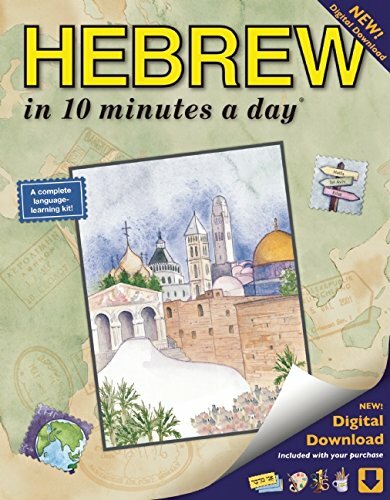 Save 39% on the HEBREW in 10 minutes a day: Language course for beginning and advanced study. Includes Workbook, Flash Cards, Sticky Labels, Menu Guide, Software, ... Grammar. Bilingual Books, Inc. (Publisher) by Bilingual Books Inc at Translate This Website. MPN: colour illus, maps & worksheets. Hurry! Limited time offer. Offer valid only while supplies last. Now learning Hebrew is simply a breeze! The new digital download includes interactive computer Sticky Labels, Flash Cards and special activities. Now learning Hebrew is simply a breeze! The new digital download includes interactive computer Sticky Labels, Flash Cards and special activities. It’s a blend of entertainment and education―you’ll learn faster than ever and have fun too! This book/software combo teaches you the most useful words and phrases so you’re speaking with ease. Whether you’re enjoying the beaches in Tel Aviv, exploring Jaffa, or connecting with your heritage, “HEBREW in 10 minutes a day” opens doors to this wonderful language! The “10 minutes a day” proven methodology guarantees success―all you have to do is set aside 10 minutes and you’ll be on your way. Why 10 minutes a day? Because 10 minutes is doable, it fits easily into your life and it’s not overwhelming. The book is purposely designed to look like a child’s workbook―it’s not intimidating or overwhelming. Instead, it’s approachable and engaging for everyone at any age. The book covers material equivalent to more than a year of high school Hebrew or the 1st quarter of Hebrew at university. The 132-page illustrated workbook: Use the book to guide you, step-by-step, through learning and speaking Hebrew. The Hebrew alphabet: Use this lesson to learn the Hebrew alphabet. Write each letter and become familiar with its pronunciation and shape. With a little practice, you’ll be on your way to reading Hebrew in the very next lesson. Cut-out Menu Guide: Practice at your local deli and take it on your trip. Pronunciation Guide: With the Guide and simple phonetics above each Hebrew word, it’s easy for native English speakers to begin speaking Hebrew with the correct pronunciation. Glossary of over 2,000 new words, definitions, and pronunciation: So you can quickly look up a Hebrew word, its pronunciation and definition. If you have any questions about this product by Bilingual Books Inc, contact us by completing and submitting the form below. If you are looking for a specif part number, please include it with your message.